The first round of singles is complete at the Oracle ITA National Fall Championships in Surprise Arizona, with 5 of the 16 men's singles seeds and three of the 16 women's singles seeds failing to advance. Both No. 4 seeds were eliminated, with ITA Riviera All-American champion Sophie Whittle losing to Jessica Failla of Pepperdine 3-6, 7-5, 6-4. 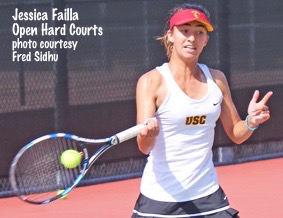 Failla, who spent two years at USC, played only two matches last fall and none in the dual match season after transferring to Pepperdine, but she will be a valuable addition to the Waves this season. In the men's draw, USC's Brandon Holt lost to Harrison Scott of Texas 4-6, 6-4, 6-4. Both seeded Stanford women fell in the first round, with No. 8 Melissa Lord losing to Marta Gonzalez of Georgia 6-4, 6-2, and No. 14 seed Michaela Gordon losing to Silvia Ambrosio of Purdue 6-3, 6-2. Top seed Fernanda Contreras of Vanderbilt, No. 2 seed Estela Perez-Somarriba of Miami and No. 3 seed Evgenyia Levashova of Pepperdine all advanced in straight sets. In addition to Holt, No. 9 seed Emil Reinberg of Georgia, No. 13 seed Aziz Kijametovic of Old Dominion, No. 14 seed Jake Van Emburgh and No. 16 seed Alex Lebedev of Notre Dame were ousted. Reinberg lost to Jason Kros of Virginia Tech 7-6(8), 6-3; Kijametovic lost to Will Little of Baylor 6-3, 6-2; Van Emburgh lost to Niclas Braun of Mississippi State 6-3, 6-4; and Lebedev lost to David Wolfson of Cornell 3-6, 6-3, 6-1. Top seed Petros Chrysochos of Wake Forest and No. 2 seed Christian Sigsgaard of Texas won their matches in straight sets, while No. 3 seed Paul Jubb of South Carolina came from a set down to advance. Although men's first round doubles is still ongoing, the opening round of women's doubles is complete, with top seeds Michaela Gordon and Emily Arbuthnott of Stanford falling to UCLA's Elysia Bolton and Jada Hart 6-4, 6-2. No. 5 seeds Nina Khmelnitchkaia and Janet Koch of Kansas and No. 7 seeds Sofia Blanco and Lisa Marie Rioux of Oklahoma State also lost their opening matches. Top men's seeds Jack Mingjie Lin and Will Matheson of Columbia also lost in the first round, to Vinny Gillespie and Barny Thorold of Drake, by a score of 6-3, 7-6(7). Play continues Thursday with the second round in singles and doubles. Live scores can be found here. The USTA released the Orange Bowl acceptances for the 16s divisions this week, with Americans Alex Bernard and Kailey Evans topping the lists. Although no ITF Junior Circuit ranking points are on the line, the younger age division is given equal treatment throughout the tournament, with the only difference being that the tournament starts and ends one day earlier than the 18s. For the complete lists and more information on the tournaments, see the USTA's Orange Bowl tournament page. 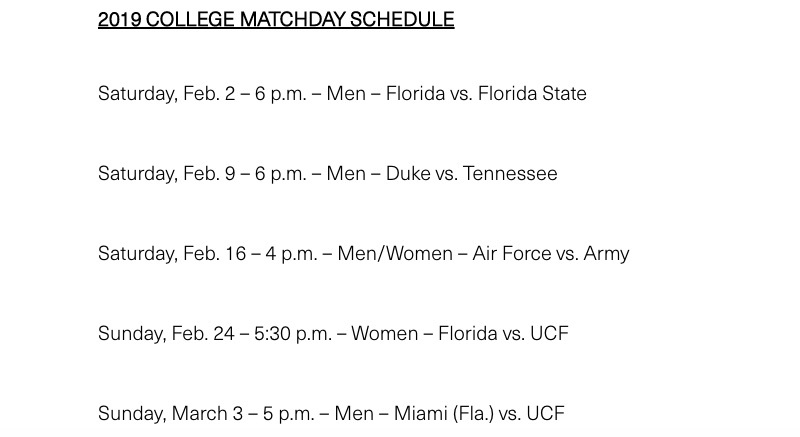 The USTA has listed the dates for its College Match Days in Lake Nona this winter, with five dual match dates, including one, February 16th, that features both the men's and women's teams of the Army and Air Force. 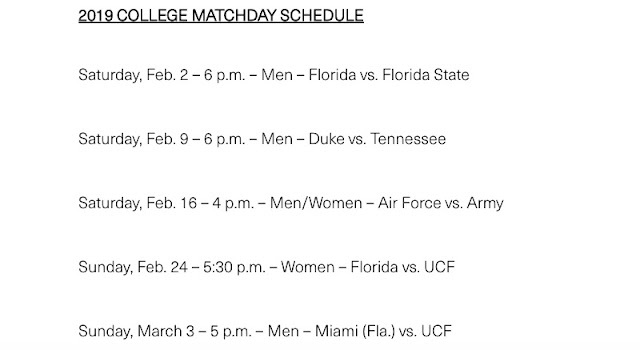 The Tennis Channel will be broadcasting these events live. Information on tickets, which are free, will be available at this USTA webpage as the dates get closer. The New York Times has published a feature on Leo Borg, the son of tennis great Bjorn Borg. Leo, 15, is currently playing the ITF Junior Circuit, with his ranking around 450. He played the Junior Orange Bowl 14s last year, reaching the quarterfinals before losing to eventual champion Shintaro Mochizuki, and watching him for the first time, I was struck by how much his game, especially his backhand, resembled his father's. The article emphasizes his mother's reluctance to have him pursue tennis, given all the scrutiny that path would subject him to.